Although Yosemite Valley is only a tiny portion of the national park, it’s where the bulk of the visitors end up. And rightly so, as visitors can get spectacular views of Yosemite Falls, Half Dome, El Capitan and countless other natural features along this seven mile stretch of the park. But there’s much more to Yosemite National Park, than just the valley, and The Road Guide to Yosemite tells you how to discover it all. Penned by Master Interpretive Ranger Bob Rooney, this easy-to-use-guide is divided into seven sections; Yosemite Valley and each of the major roadways into the park. Each section features viewpoints, sights and interesting stops along the route. The stops are all marked by roadside markers, which are clearly indicated in the book. Even better, at the end of each entry, the mileage to the next marker, as well as if its on the right or left, are also noted. 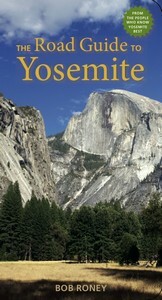 Rooney also covers the highlights of Yosemite Valley, and includes an interesting history, wildlife and geology section. And the photos and maps are excellent. I live near Yosemite and have been going there for as long as I can remember, so I’m pretty familiar with the park. In that respect I was pleased to see that Rooney did it justice. Many guide books merely gloss over the destination. Gladly this isn’t the case with The Road Guide to Yosemite. Bottom line — if you’re planning on exploring Yosemite National Park, then don’t leave home without this essential resource. This entry was posted in Book Reviews and tagged Bob Roney, geology, guide, nature, road trip, travel, Yosemite by Candy B. Harrington. Bookmark the permalink.